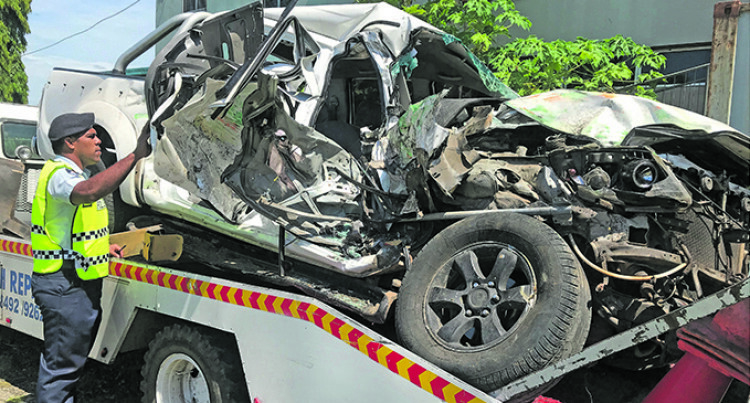 The vehicle which was involved in the road accident at Navau, Ba, last Friday night which claimed the lives of three people. The vehicle was loaded up and removed on December 22, 2018. Ba accident victim Roshni Sharma was still in critical condition at Lautoka Hospital last night. Her husband Shareen Kumar Sharma confirmed it. He said the funeral of the three who died, Basmati, Lalita Devi Sharma and Divnesh Kumar Sharma, would be held in Lautoka on Wednesday. They were in a twin cab which crashed into a bus at Navau in Ba last Friday night. Police are investigating.